All programs include a daily, nutritious mid-morning snack and free time for outdoor play, weather permitting. Children’s House overlooks the Rappahannock River in beautiful old town Fredericksburg, VA. Our sunny one-room school provides an excellent Montessori environment for our students. The large space allows students to explore each curriculum area freely while also interacting with classmates. It’s not unusual to see older students helping younger ones, and it’s a great way for children to learn leadership and mentoring skills. Outdoors, a large green area extends classroom learning with room for gardening, water work, sandbox and play activities. Children’s House boasts an extensive collection of uniquely designed materials to enhance our students’ learning experience. Our classroom includes dedicated areas for language and reading skills, math, science and nature, world cultures, and life skills. Life skills are everyday tasks that are often overlooked in traditional classrooms. Skills like pouring water, using tongs, and opening/closing buttons and zippers are important skills that boost children’s confidence and independence. Imagine your 3-year old pouring her own drinks at mealtimes --- it happens everyday at Children’s House! 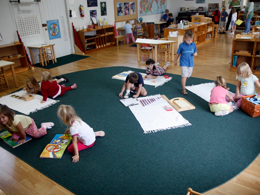 Children’s House was founded in 2000 by families who wanted a non-denominational, Montessori preschool for their children. A year later, they added an extended day kindergarten. The school continues to be parent-owned with parent-volunteers involved in all facets of school life, from leading special lessons with the children to organizing fundraisers to serving on the board of directors.